A Michigan middle school student won’t be returning to school Monday because he was the target of repeated bullying and racial harassment at his suburban school, WDIV reports. 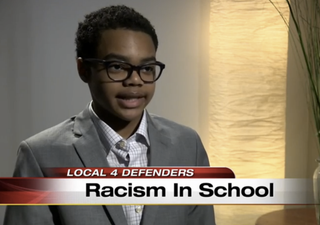 Phoenix Williams, a 13-year-old at Bloomfield Hills Middle School, has come forward with his story after capturing students’ racist taunts on his cellphone. The video shows his bullies repeatedly calling him the n-word and encouraging other students to follow suit. Phoenix told news station WDIV that one student actually leaned over and told another classmate, “I’ll give you a piece of candy if you call Phoenix a dirty n—ger.” One student snatched his hat off his head and threw it to the back of the bus before telling him to go get it, repeating the slur. Before this escalated incident, which occurred March 13 during a field trip to a music concert, Phoenix said that his classmates had begun telling racist jokes between them, freely using the offensive language. Proof of his harassment secured, Phoenix finally approached his mother, Shanari Williams, who went to the school, asking that the two bullies be expelled. However, the school did not comply with that request, taking an alternative action that it called “appropriate.” The school would not say what disciplinary action the students actually faced. As for Phoenix, he’s keeping up with his class, completing assignments online at home. His mother, fearing for his safety, is not having her son return to school right now; she’s waiting to see if the disciplinary action is changed and if students will be educated on diversity. Both the school district and the Williams family have contacted the Bloomfield Township Police Department, and an investigation is under way. The families of both students responsible for the bullying released statements.